During the past several weeks Nancy and I have been preparing for our upcoming trip to Africa, so we have not had much time to devote to our construction project. However, with the unseasonably warm weather this week it was fun to get outside and dream about what our landscape will look like. We are encouraged by a new friendship with a local landscaper-couple who is involved in missions and is part of the same church network that we are joining. In fact, I believe Dean and Marchelle are an answer to prayer. During the past month or more, I had been inviting local landscapers to come look at our property and give me estimates for the work we need to do. Some of them are so busy that they did not even call me back. Others did come look, but decided that the project did not fit into their schedule. One company was willing to do everything we wanted, but their price was so high that I about fainted upon hearing it. Anyway, Dean and Marchelle have helped us think through a landscape plan and Dean spent a day transforming our rock pile into a rock wall between our house and the street. It is difficult to see in the picture above, but there will be stairs through a gap in the wall that will lead from the driveway to a walkway to the front door. Dean and Marchelle intend to be at the same international conference that Nancy and I are attending next week. After the conference they will return to Lancaster County and their landscaping projects, including hydro-seeding our lawn. We, on the other hand, will fly directly to Africa where we hope to water the seeds of God’s Kingdom there. I had the idea that I wanted to re-purpose some of the old boards from my woodpile and build bookshelves for my office. The design worked well in my head and even when I drew it on paper. However, after I started actually building, I became overwhelmed. During the holidays, JP, my son-in-law, helped me dig the boards out of the woodpile. The boards were wet and very dirty. So, most of them had to be dried and cleaned which included considerable sanding. I did not expect that it would take 30 minutes or so to just clean up each board. Because I wanted the shelves to be 12 inches deep, I had to double the number of boards. Most of the boards were eight inches or less, so I needed to cut and glue boards together to achieve my desired depth. After all this preparation, I still needed to cut the groves in the legs, and insert the shelves. I assembled the shelves on the floor and they had to be turned upright. I could not do that by myself, so I had to find a neighbor to come help me. The project stretched out for a couple weeks. A couple times I almost gave up. Was this much effort worth it? Nevertheless, I stuck with the project and it turned out well. The old boards are sturdy, match the floor and continue the theme in my office. Generally, it is more difficult to re-purpose old things than to build or buy new. However, the old has beauty and character that cannot be matched by new stuff. Now that the project is completed, I’m glad I persevered. 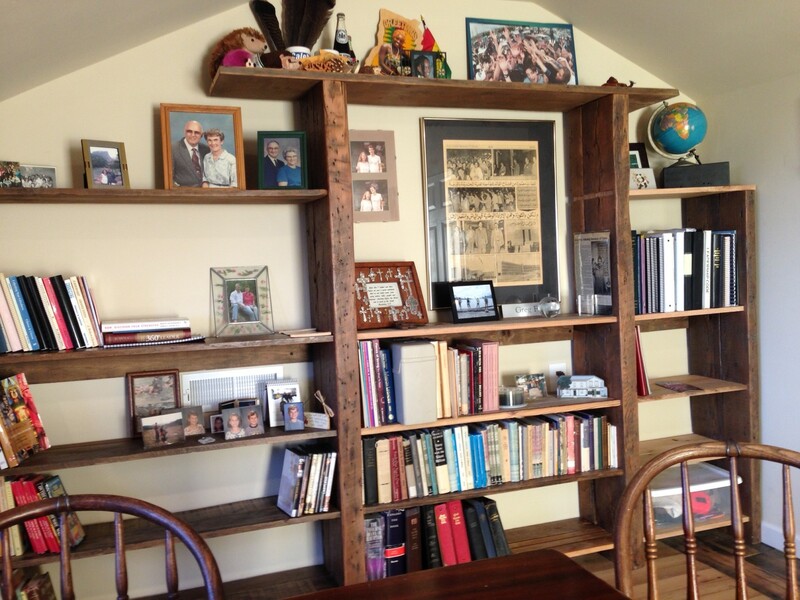 Not only are the bookshelves functional, they are fun to look at. They remind me that often we find the most beauty, strength and stability from the past. It was a very cold early February weekend 36 years ago (1980) that 500 other Penn State students and I were exposed to a fresh-to-us biblical understanding that our God is a global God and He desires and deserves to be worshiped by all nations. The information we received during that Student Conference on World Evangelization and the subsequent “Perspectives” class changed the course of our lives. Every major decision I have made in my life has been influenced by the understanding of the biblical meta-narrative that we learned. Last evening was also very cold in State College. Nancy and I were there because the current Perspectives course coordinator, Julie McEIfish (pictured with Nancy and me above) had invited me to teach Lesson 2, The Story of His Glory. Julie was a fellow PSU student back in the early 80s. I have taught this material numerous times in other places, but what an honor and privilege it was to teach at the current PSU course! I had to fight back emotions as I waited to be introduced to the students. Last summer Nancy and I responded to an invitation to visit the church that the realtor who represented the sellers of our church-house attends. Lisa knew that we were looking for a Christian fellowship to join and accurately guessed that we would enjoy her church. We have been attending Sunday morning and other services and have begun to connect with Lisa’s small group. Our spirits have been lifted! Last evening we were wonderfully blessed by the small group. They, along with the pastor, came to our house to pray and dedicate it to the Lord. We spent the evening moving from room to room praying prayers of protection and anointing. Nancy and I feel honored that these new friends would come and minister to us in that way! Since my last post, we also were blessed by visits from three of our four children and their spouses as well as from a number of other family and friends. It is fun to give these loved ones tours of the house and observe their reactions to the beauty and function the Lord has enabled us to create here! The house is working pretty well, although we have had a couple issues. One night when a couple of our guest rooms were full, the plumbing clogged! None of the drains were working and all the showers, tubs, sinks filled with waste water. It was a major clog and required extraordinary effort by professionals to clear it. Thankfully, they did and we have not had any more problems. This week, during the first cold spell of the year, the pipes leading to the hall bathroom froze. We were able to thaw them out and hopefully diagnosed the problem which the contractor expects to fix tomorrow. We are still unpacking, organizing and finishing various non-critical projects. However, we are feeling more at home and grateful for this house and all of God’s wonderful blessings! 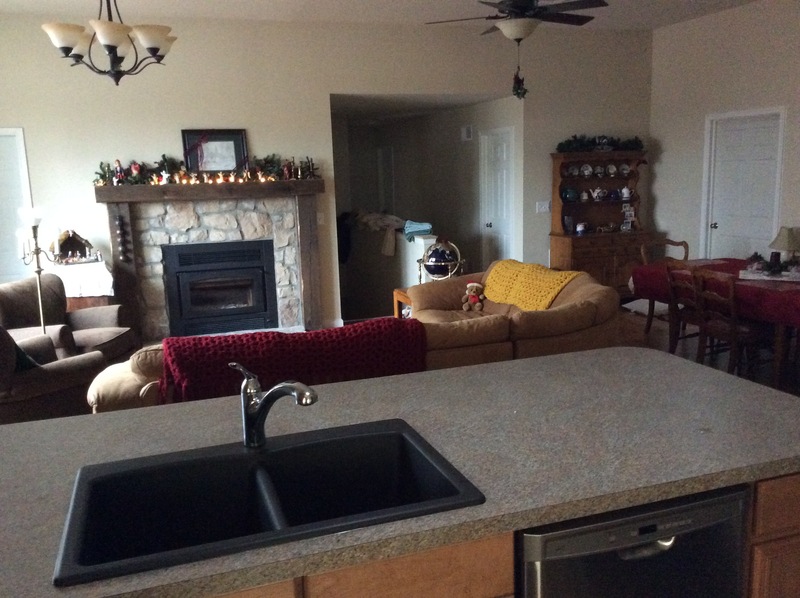 Our kitchen counter, great room, and into the hall to the bedrooms. We first slept in our new house a week ago, exactly one year after we first saw this property. The first few nights were more like camping than living in a house. However, we have begun to settle in. Nancy found some good deals on furniture at a local re-sale shop and I, with much help, worked to transfer our stuff from storage into the house. There is still a lot to finish, but we are beginning to feel at home here. We hosted our first dinner guests last Tuesday evening. Since we had not found our dishes yet, we used paper plates. We also didn’t have our regular silverware, so Nancy’s grandmother’s tarnished antique silver filled in. Our son Jesse and his new wife Cecile, along with Jesse’s friend Miles, and Miles’s dog spent a couple days with us as we celebrated the Christmas holiday. They spent Christmas Eve day helping us move stuff from storage and unpacking. Then we all enjoyed a wonderful Christmas Eve service at the church with which Nancy and I have been connecting. Nancy was disappointed that we did not have a Christmas tree, but there simply wasn’t time. Today she found an artificial tree at a huge discount and plans to trim it in time for our family gathering January first. The house is functioning and we passed the final inspection. However, much needs to be completed before we can consider construction done. Shelves need to be built in the basement, garage, in my office, etc. There are a number of places that still need to be painted. Curtains and blinds need to be hung. There are scores of boxes in the basement that should be dealt with. The stairs to the basement need to be finished. I would like to keep pushing until we finish. However, we have already invested so much time and money… We missed our first two completion dates and we have over-spent our budget. On the other hand, it seems appropriate for me to re-focus my attention back on global ministry opportunities that have moved to the back burner during the past six months. I pray for the Lord’s direction as we enter 2016! Our new kitchen ready for life! It was a year ago that Nancy and I discovered the abandoned Poplar Grove Chapel as we were considering a move from Spokane, WA to Lancaster County, PA. The unfinished fifty year old church building had not been used for 20 to 25 years. However, when Nancy and I looked at it we both felt that the building had potential to be transformed into our home. More importantly, we felt the Lord nudging us to reclaim the property for his purpose, for his glory and for our pleasure. It seems appropriate that, as an act of poetic symetry, God enabled us to move into the place exactly one year after we first looked at the property. For the first time, we slept in our new house last night. We bathed in our new tub, cooked on our new stove, stored food in our refridgerater, ran our washer and dryer, etc. Nancy and I now live in the house! We reached our goal to be in by Christmas. To get us to this point we had a productive week that culminated with a passed final inspection Friday afternoon. The plumbing is finished. 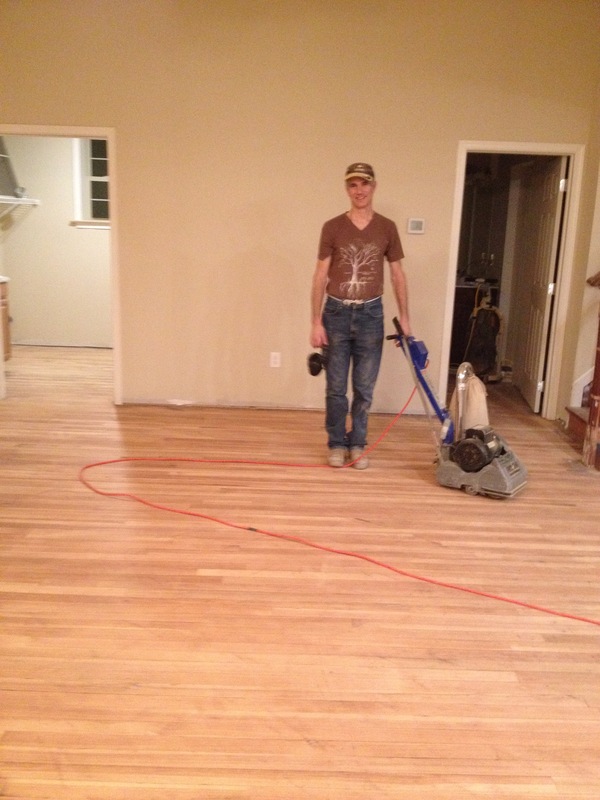 The floors are done. The appliances are installed. The front door is sealed, etc. There are still a number of items that need to be completed and we need to move our stuff from storage to the house. However, we are delighted to be living in the house – a gift from God! This week we removed several of the items from our “to be done before moving in” check list. Most of the items on the list are small. However, there remained one large project that I was hesitant to start. I expect that once we start refinishing the hardwood floor in the great, laundry, and bath rooms that other projects will be forced to pause. For example, I did not want to start the floor and delay the plumber or some other essential work. The HVAC guys and the electricians both finished their work. The plumber completed most of his work. We now have running hot and cold water! I finished tiling the showers and installed the kitchen appliances. Our general contractor’s assistant installed the kitchen counter, hung the stair rails and completed some custom work like the door to the upstairs office and baseboards over a couple of the rough floors remaining from the old construction. So, since we did not expect anyone else to be in the house over the weekend, Nancy and I tackled the final large project – refinishing the hardwood floors. Saturday morning I rented two large sanders, drum and oscillating, and an edger. Nancy and I ran the machines all day, burning through nearly $300 of 36 grit sandpaper. We did not finish! The floors were much rougher than I realized. As we removed the old finish we began to see the terrible job the previous sanders had done. Gouges covered the entire surface. It looked as if they had sanded with a harrow. We will not remove all the divots, but we are getting close to using finer grit sandpaper to smoth out the surface. We hope to release the beauty that is in those old hardwood boards! The inspector came by Friday afternoon and found about ten small items that must be completed before we will pass our final inspection. We are getting close!